New EPA rules for remodeling and painting. In April of this year, new EPA rules that cover remodeling and painting in housing built before 1978 went into effect. The purpose of these rules is to limit household lead contamination from lead paint during remodeling and painting activities. The use of lead paint was widespread prior to its ban, and according to the EPA, dust from remodeling and painting activities is the leading source of human lead exposure. While lead is harmful to all age groups, it is particularly dangerous for children under six years of age, and can cause reduced IQ, learning disabilities, and behavior problems. Federal law now requires any contractor that disturbs painted surfaces in homes, child care facilities and schools, built before 1978, to be certified by the EPA and to follow specific work practices to prevent lead contamination. This new rule, called the Renovation, Repair, and Painting (RRP) rule applies to any work that disturbs more than six square feet of painted surface on the interior, and twenty square feet of surface on the exterior of the house. Any window replacement, even if falling below the thresholds above, is subject to the rule. Thus, basically any contractor working on your home doing painting, repairs, or remodeling that is disturbing any painted surface, must have EPA certification. Homeowners working on their own properties are exempt from compliance with the rule. Fines for non-compliance or lack of certification are hefty, so legitimate contractors have a serious incentive to be certified and to follow the RRP work practices. Before 1978, when lead was banned at a paint additive, lead was added to paint to improve the paint's durability. Lead paint is more likely to be found on exterior surfaces than interior, and more likely to be on trim than on plaster or wall board. In the houses that we have tested in Hollin Hills so far, a majority have had some lead paint, either on the interior or exterior. The EPA rule gives the renovator two options. He must either assume that all the paint in surfaces he is disturbing contain lead, and follow the specified RRP work practices, or the paint can be tested to prove the absence of lead. If testing establishes lead levels below the recognized thresholds, no further special actions need be taken. Otherwise, the RRP work practices must be implemented. The RRP practices require limiting access to the work area, covering and sealing all adjacent surfaces with plastic and tape to prevent dust contamination, sealing off doors, windows, and duct work, and proper disposal of all removed painted components ( such as plaster, drywall, trim, window frames) and all material used for dust containment. There must then be rigorous clean up with a HEPA vacuum and wet wiping. An EPA certified renovator must supervise the work and clean up, and conduct testing at the completion of the work to document that the clean up has meet EPA requirements. 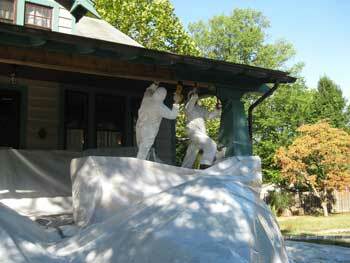 These practices apply both to interior and exterior work. Certain record keeping practices by the renovator are also required. Most important for the homeowner is the requirement that the EPA brochure, “Renovate Right,” be supplied to the homeowner prior to commencement of the work. It is often easier and cheaper to test for lead to establish its absence, than to follow the rigorous work and clean up practices. Painted wood work can be tested by a certified renovator with an EPA approved lead test kit. These chemical kits are fairly inexpensive and easy to use. Unfortunately, they are not approved for use on painted plaster or drywall. These surfaces must be tested with an X-ray fluorescence gun. This device can detect lead in any of the paint layers in the spot tested, without damaging the painted surface. But the gun and the technician to operate it are expensive. Testing of all surfaces in a house is typically in the $500 range. So if you are doing a small trim repair job chemical testing is reasonable. If you are contemplating painting the entire house, or a major remodeling project, X-ray testing is cost effective. While the new rule is fairly burdensome, and may increase the cost of the job, the danger from lead is real, particularly if you have small children. Ensuring that contractors working on your house are EPA certified (ask to see a copy of the certification,) as well as licensed and insured, is always wise, and may save you expense and hassle in the long run. Read about lead-hazard information for renovation, repair and painting activities in the EPA lead hazard information pamphlet The LEAD-SAFE Certified Guide to RENOVATE RIGHT (PDF) . Fina Construction is fully certified to conduct renovation, repair, and painting projects that disturb lead-based paint. 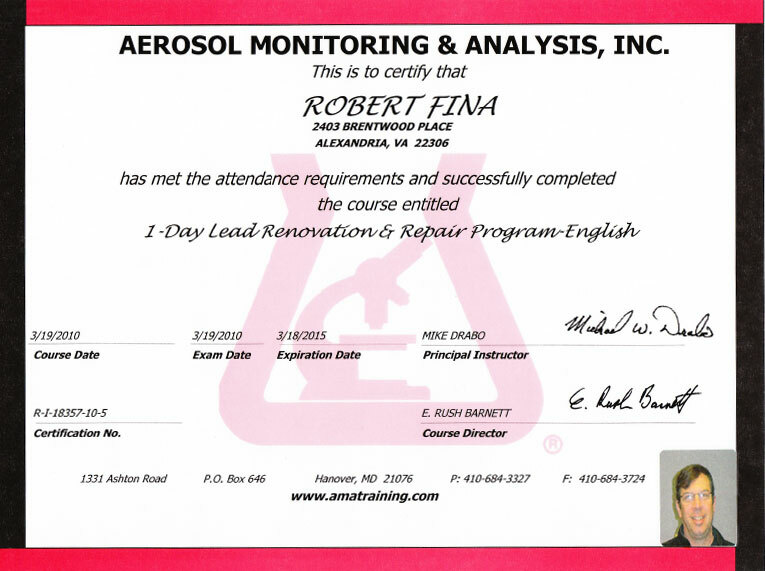 To view a copy of our certification, click here. Fina crew complying with RRP rule for exterior work. If you have any additional questions about lead, please visit the EPA website for more information. Call us at (703)718-0804 for more information, or email us.